Heat oven to 400°F. Separate dough into 10 biscuits; separate each into 2 layers. On ungreased large cookie sheet, arrange biscuit rounds 2 inches apart. Bake 7 to 11 minutes or until golden brown. Remove biscuit rounds from cookie sheet; place on cooling rack. Cool completely, about 10 minutes. Top each baked biscuit round with about 1 teaspoon pizza sauce; top each with 2 or 3 slices pepperoni. With aerosol can of cheese, squeeze cheese faces on top of snacks. Serve immediately, or store in tightly covered container in refrigerator up to 1 hour. This is a great recipe to have on hand for kids to make themselves. Just bake the biscuit rounds as directed and store in a covered container for up to 2 days. 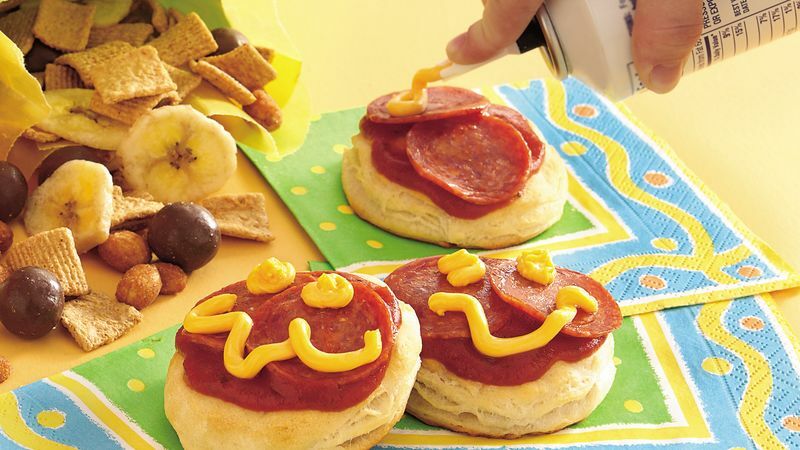 Kids can top with the pizza sauce, pepperoni and cheese whenever they need a snack!